Back in the beginning of August I wrote about “Four Little Words”, “electronic communication transactional records“, which the Obama administration wanted to add to the FBI’s ability to make it easier for the FBI to compel companies to turn over records of an individual’s Internet activity without a court order if agents deem the information relevant to a terrorism or intelligence investigation. The lawyers were claiming that this would not give them access to the content of the e-mail just access to the addresses to which an Internet user sends e-mail; the times and dates e-mail was sent and received; and possibly a user’s browser history. Sounds invasive? Well, it wasn’t good enough, either. Charles Savage reports in the New York Times that Federal law enforcement and national security officials want to make it easier to wiretap the Internet. Essentially, officials want Congress to require all services that enable communications – including encrypted e-mail transmitters like BlackBerry, social networking Web sites like Facebook and software that allows direct “peer to peer” messaging like Skype – to be technically capable of complying if served with a wiretap order. The mandate would include being able to intercept and unscramble encrypted messages. The bill, which the Obama administration plans to submit to lawmakers next year, raises fresh questions about how to balance security needs with protecting privacy and fostering innovation. And because security services around the world face the same problem, it could set an example that is copied globally. The bill would also require Financial Institutions to report all electronic money transfers into and out of the country, no matter how small. Currently banks must report international money transfers of $10,000 or greater. But critics have called it part of a disturbing trend by government security agencies in the wake of the 2001 attacks to seek more access to personal data without adequately demonstrating its utility. Financial institutions say that they already feel burdened by anti-terrorism rules requiring them to provide data, and that they object to new ones. Marcy Wheeler points out that it may be the banks that bail us out of this further unfettered invasion of the government into our lives. Any communication you make, any financial transaction you make, the Obama Administration thinks nine years after 9/11 is the time to demand such access. I suspect it’s only the corporations can save us from this power grab. Not only are corporations doing business in the US not going to want all their transactions accessible by the government (we’ve already stolen enough corporate secrets), but banks aren’t going to want to track transactions at that level. In the late 19th century it was called Social Darwinism. Only the fittest should survive, and any effort to save the less fit will undermine the moral fiber of society. Republicans have wanted to destroy Social Security since it was invented… Remember George W. Bush’s proposal to privatize it? Had America agreed with him, millions of retirees would have been impoverished in 2008 when the stock market imploded. Of course Republicans don’t talk openly about destroying Social Security, because it’s so popular. The new Republican “pledge” promises only to put it on a “fiscally responsible footing.” Translated: we’ll privatize it. Republicans also hate unemployment insurance. They’ve voted against every extension because, they say, it coddles the unemployed and keeps them from taking available jobs. That’s absurd. There are still 5 job seekers for every job opening, and unemployment insurance in most states pays only a small fraction of the full-time wage. Finally, like Hoover and Mellon, Republicans want to cut the deficit and balance the budget at a time when a large portion of the workforce is idle. This defies economic logic. When consumers aren’t spending, businesses aren’t investing and exports can’t possibly fill the gap, and when state governments are slashing their budgets, the federal government has to spend more. Otherwise, the Great Recession will turn into exactly what Hoover and Mellon ushered in – a seemingly endless Great Depression. What are the results of Hoover/Mellon policies? From another survey we learn that the 25 top hedge-fund managers got an average of $1 billion each, but paid an average of 17 percent in taxes (because so much of their income is considered capital gains, taxed at 15 percent thanks to the Bush tax cuts). The rest of America got poorer, of course. The number in poverty rose to a post-war high. The median wage continues to deteriorate. And some 20 million Americans don’t have work. Only twice before in American history has so much been held by so few, and the gap between them and the great majority been a chasm – the late 1920s, and the era of the robber barons in the 1880s. What can be done about mass unemployment? All the wise heads agree: there are no quick or easy answers. There is work to be done, but workers aren’t ready to do it – they’re in the wrong places, or they have the wrong skills. Our problems are “structural,” and will take many years to solve. After all, what should we be seeing if statements like those of Mr. Kocherlakota or Mr. Clinton were true? The answer is, there should be significant labor shortages somewhere in America – major industries that are trying to expand but are having trouble hiring, major classes of workers who find their skills in great demand, major parts of the country with low unemployment even as the rest of the nation suffers. None of these things exist. Job openings have plunged in every major sector, while the number of workers forced into part-time employment in almost all industries has soared. Unemployment has surged in every major occupational category. Only three states, with a combined population not much larger than that of Brooklyn, have unemployment rates below 5 percent. Oh, and where are these firms that “can’t find appropriate workers”? … (T)he percentage citing problems with labor quality is now at an all-time low, reflecting the reality that these days even highly skilled workers are desperate for employment. So all the evidence contradicts the claim that we’re mainly suffering from structural unemployment. Why, then, has this claim become so popular? I’ve been looking at what self-proclaimed experts were saying about unemployment during the Great Depression; it was almost identical to what Very Serious People are saying now. Unemployment cannot be brought down rapidly, declared one 1935 analysis, because the work force is “unadaptable and untrained. It cannot respond to the opportunities which industry may offer.” A few years later, a large defense buildup finally provided a fiscal stimulus adequate to the economy’s needs – and suddenly industry was eager to employ those “unadaptable and untrained” workers. So what you need to know is that there is no evidence whatsoever to back these claims. We aren’t suffering from a shortage of needed skills; we’re suffering from a lack of policy resolve. As I said, structural unemployment isn’t a real problem, it’s an excuse – a reason not to act on America’s problems at a time when action is desperately needed. And for all their ‘Galtian’ Social Darwinist self reliance, what is the richest woman in the world doing? The Queen asked ministers for a poverty handout to help heat her palaces but was rebuffed because they feared it would be a public relations disaster, documents disclosed under the Freedom of Information Act reveal. Royal aides were told that the £60m worth of energy-saving grants were aimed at families on low incomes and if the money was given to Buckingham Palace instead of housing associations or hospitals it could lead to “adverse publicity” for the Queen and the Government. It seems our evil, greedy, immoral, hypocritical “betters” are all too willing to accept government handouts for “the right sort of people” and steal food out of the mouths of babies, the sick, and the elderly so they can line their pockets to impress others of their “class” with their conspicuous consumption and ‘flash cash’. Note: from Progressive Blue and cross-posted at DailyKos. In the quest to maintain a Democrat majority it seems easy to overlook the race for New York State Attorney General. Considering a powerful social and economic justice policy position where the jurisdiction includes Wall Street and the traditional influence this office has had over media and talk shows it’s not about majority but justice vs. injustice. Now Eric Schneiderman who is committed to “protecting homeowners and consumers from bad actors on Wall Street” faces a Republican who has suggested that he would “de-emphasize the high-profile securities fraud cases that defined the tenures of Attorney General Andrew M. Cuomo and Eliot Spitzer.” In a nation where the banking lobbyist induced false claim that “sound economics means hands off Wall St.” is too often heard, think back the early 1990’s when nobody seemed interested in the big money crimes and Eliot Spitzer did much to change the national focus. But Senator Schneiderman represents so much more that that. Not just a politician but a public servant with the energy and willpower to fight for the people. Looking at what this man has to offer in this high profile office with the power to steer the national debate, it seems obvious that a NY loss would be a setback for all Americans. The constant refrain that liberals don’t appreciate the administration’s accomplishments betrays deep frustration. It was a given the right would try to destroy Obama’s presidency. It was a given Republicans would be obstructionists. It was a given the media would run with sensationalist stories. It was a given there would be a natural dip from the euphoric highs of the inauguration. Obama’s team was prepared to ride out the trough(s). But they were not prepared for a determined segment of the left to ignore party and focus on principle, to ignore happy talk and demand accountability. As president, Obama has done much good and has achieved a number of impressive legislative victories. He is a smart, thoughtful and disciplined man. He has a wonderful family. His staff (many of whom I’ve worked with in past campaigns) are good and decent people trying to improve their country and working tirelessly under extreme stress. But that doesn’t mean progressives should set aside the things they’ve fought for their entire adult life. It doesn’t mean they should stay silent if they think the White House is undermining the progressive cause. The Obama administration urged a federal judge early Saturday to dismiss a lawsuit over its targeting of a U.S. citizen for killing overseas, saying that the case would reveal state secrets. The U.S.-born citizen, Anwar al-Aulaqi, is a cleric now believed to be in Yemen. Federal authorities allege that he is leading a branch of al-Qaeda there. Government lawyers called the state-secrets argument a last resort to toss out the case, and it seems likely to revive a debate over the reach of a president’s powers in the global war against al-Qaeda. September 27 is the 270th day of the year (271st in leap years) in the Gregorian calendar. There are 95 days remaining until the end of the year. On this day in 1922, Jean-François Champollion deciphered the hieroglyphs of the Rosetta Stone with the help of groundwork laid by his predecessors: Athanasius Kircher, Silvestre de Sacy, Johan David Akerblad, Thomas Young, and William John Bankes. 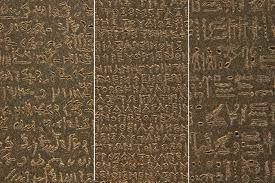 Champollion translated parts of the Rosetta Stone, showing that the Egyptian writing system was a combination of phonetic and ideographic signs. Thomas Young was one of the first to attempt decipherment of the Egyptian hieroglyphs, basing his own work on the investigations of Swedish diplomat Akerblad, who built up a demotic alphabet of 29 letters (15 turned out to be correct) and translated all personal names and other words in the Demotic part of the Rosetta Stone in 1802. Akerblad however, wrongly believed that demotic was entirely phonetic or alphabetic. Young thought the same, and by 1814 he had completely translated the enchorial (which Champollion labeled Demotic as it is called today) text of the Rosetta Stone (he had a list with 86 demotic words). Young then studied the hieroglyphic alphabet and made some progress but failed to recognise that demotic and hieroglyphic texts were paraphrases and not simple translations. In 1823 he published an Account of the Recent Discoveries in Hieroglyphic Literature and Egyptian Antiquities. Some of Young’s conclusions appeared in the famous article Egypt he wrote for the 1818 edition of the Encyclopædia Britannica. When Champollion, in 1822, published his translation of the hieroglyphs and the key to the grammatical system, Young and all others praised this work. Young had indicated in a letter to Gurney that he wished to see Champollion acknowledge that he had made use of Young’s earlier work in assisting his eventual deciphering of hieroglyphics. Champollion was unwilling to share the credit even though initially he had not recognized that hieroglyphics were phonetic. Young corrected him on this, and Champollion attempted to have an early article withdrawn once he realized his mistake. Strongly motivated by the political tensions of that time, the British supported Young and the French Champollion. Champollion completely translated the hieroglyphic grammar based in part upon the earlier work of others including Young. However, Champollion maintained that he alone had deciphered the hieroglyphs. After 1826, he did offer Young access to demotic manuscripts in the Louvre, when he was a curator. Baron Georges Cuvier (1825) credited Champollion’s work as an important aid in dating the Dendera Zodiac. I have been thinking about sustainability for a long, long time. Unfortunately, in my scientific analysis, it not possible if we continue on the route that we have chosen. This is an extremely complex topic, and might even deserve its own, new, date. I am thinking that Wednesdays might be a good time for it. This is more speculation than science, so it does not properly belong on Pique the Geek for the long term. This will be the most controversial topic that I have ever tackled. I may be dead wrong in some of my speculations, but a lot of thought has gone into them. I offer no easy remedies but do ask the hard, horrible questions and illustrate them with facts. I will ask that you, my readers, tell me whether this deserves a new series, uncoupled from Pique the Geek. Please read further. Well, I know someone who’s a big fan of The Amazing Race. New Season starts tonight. 60 Minutes has Af-Pak (BREAKING! War Reporters Shot At! Quelle Horreur! ), Park51, and Drew Brees. New Simpsons and Family Guy (1 hour double episode with James Woods), also The Cleveland Show. Sunday Night Throwball, Jets @ Aquatic Mammal (as opposed to semi-aquatic monotreme. Where’s Perry? ), but why are you watching that when there’s Sox @ Yankees on ESPN? New Boardwalk Empire if you pay for premium (waste of money in my opinion). Adult Swim has the 3.5 Season Premier of Metalocalypse, a new Childrens Hospital, and Episode 3 of Season 4.5 of The Venture Brothers– Every Which Way But Zeus (last week’s episode, Pomp & Circuitry, summary). MILAN (AFP) – The ouster of Alessandro Profumo from the top post at Unicredit this week has sparked concern about future governance at Italy’s largest bank as other shake-ups rattle the European banking world. Profumo’s dramatic exit following a shareholder rebellion over Libya’s growing stake in the bank rocked Italy’s financial elite and weighed down Unicredit’s share price at a time when the country’s economy is being scrutinised by investors because of its high debt levels. Profumo, who oversaw a major international expansion by the bank in central and eastern Europe, resigned late on Tuesday after losing a shareholder confidence vote during a four-hour board meeting.